Mario + Rabbids: Kingdom Battle is ranked in the 94th percentile of games scored on OpenCritic. Ubisoft have crafted something extremely special in Mario + Rabbids: Kingdom Battle, and it's absolutely worth the time, effort, and patience to see it all the way through to the end. The references, the tone, and the way it all works with the Switch's portable nature makes it one of the platform's best by a good mile. Mario himself might not have been my favorite part of the game, but the reverence with which the game's creators hold Mario and friends was evident in every inch of this adventure. And it helped make the game come together so well. This wonky crossover is the unlikely source of a superbly designed tactical combat challenge as well as a charmingly silly adventure. Considering how disparate all the elements found in Mario + Rabbids Kingdom Battle appear on the surface, everything comes together astonishingly well when experienced as a whole. Ubisoft clearly wanted to do something unexpected with the crossover while not creating something too far out and unapproachable for longtime Mario and Rabbids fans. Mario+Rabbids Kingdom Battle is a unique game that takes strengths from both properties and refines them into a kid-friendly tactics adventure game that keeps going long after the final boss fight, with plenty of things to collect, secrets to find, challenges to beat and even a Season Pass promising a bevy of future content. "Mario + Rabbids Kingdom Battle" has lots of charmingly frivolous things to think about and it's easy to collapse into its world of tactical antics because its gameplay is so absorbing. In the most complimentary sense, it feels like something Nintendo might have done if its humor was a bit more rough. If you had told me last year that one of my favourite games of 2017 would involve Rabbids I would've called you crazy. How wrong I was - it turns out having a franchise as solid and polished as Mario does wonders to ground the humour of the childish Rabbids, and ensures this is one of the most downright enjoyable strategy games I've played in quite some time. Mario & Rabbids is far more than ‘my first strategy game’. It manages to make Rabbids likeable and even at times quite funny. The mashing with the Mario-verse means that everything feels vibrant and Nintendo-esque. Mario + Rabbids KIngdom isn't going to be a game that appeals to everyone with the slow pace and limited gameplay. It would need to be full multiplayer rather than optional co-op with a range of modes for that. However, it does have fun and casual nature and an easy going game for younger players to pick up. Ubisoft made a Mario game of the Nintendo's first party quality. It's a surprising gem which takes everything what's great in turn-based tactics. 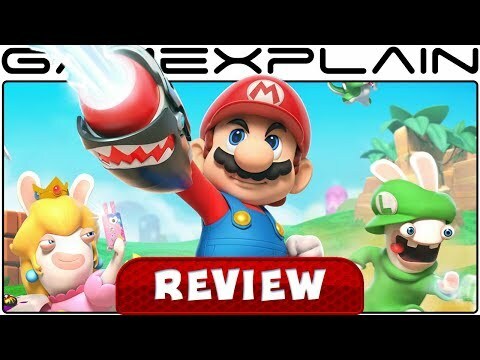 Mario+Rabbids Kingdom Battle is that it's a fantastic entry into the Mario franchise and offers a new way of playing a Mario based game with its unique perspective on the strategic gameplay and charming world that has great music. If The Legend of Zelda: Breath of the Wild wasn't enough to push your switch to Nintendo Switch, Mario + Rabbids: Kingdom Battle definitely should force your wallet. Gaming like this is as rare as hens Rabbid teeth. This game is a blast for every fan of tactics games who wants to enjoy uncomplicated and short challenges. It's perfect for everyone and everywhere. Small complaints can't beat the overall impression of this unusual crossover. All of the nods to the Mario universe, how many staples of said universe feature in how the gameplay works with this unique title and the attention to every little detail makes this not only a fresh take on a classic character, but possibly my favorite Mario game ever. Mario + Rabbids Kingdom Battle is a fun and challenging strategy game with battles that require you to be adaptable and keep switching between your team members and your arsenal of weapons. It is also a rewarding game to explore and provides easy but fun puzzles at the same time and gives you a welcome break from the mind-boggling battles. The chaotic world of Rabbids and the Kingdom of Mushroom Kingdom have been beautifully combined, highlighting the best aspects of both worlds. With its beautifully designed optics, charming (and crazy) characters, and creative problem solving, I can say that this game is easily one of my favorite games for 2017. I can only hope this relationship with Nintendo and Ubisoft continues, because aside from Breath of the Wild, Mario + Rabbids is the best game on the Switch. Mario + Rabbids Kingdom Battle is the kind of exclusive the Nintendo Switch deserves. Gorgeous, simple to learn, yet difficult to master, this collaboration between Ubisoft and Nintendo is a work of art that nobody should miss on the Nintendo's latest console. Mario + Rabbids Kingdom Battle is definitely offers the best from both worlds with a touch of XCOM. Tactical veterans will miss some challenge in most of the game but besides that the game is probably the best entry into the world of tactical RPGs. Also Super Mario and Ubisoft Fans will enjoy the amount of easter eggs and secrets hidden in the game. You don’t need to be an adult or a very well experienced RPG player to play this game. The most Nintendo, non-Nintendo game ever made. It shouldn't work, but Mario + Rabbids Kingdom Battle coalesces into something that shows a reverence to Mario and the Mushroom Kingdom, but isn't afraid to challenge its ideas. It's a wonderful game in its own right, and a bit of magic for Nintendo's Switch that's far better than it has any right to be. Like a food pairing that shouldn't work but does, Mario+Rabbids: Kingdom Battle overcame our scepticism and rewarded us with a supremely competent turn-based strategy game. Mario + Rabbids Kingdom Battle is another hit for the Nintendo Switch, and is a must buy for many different fans. Fans of Mario, fans of Rabbids, fans of turn based shooters should all have their eyes on this wacky but brilliant collaboration. Despite being one of the most crazy collaboration so far from Nintendo, Mario + Rabbids Kingdom Battle ends up being a highly competent strategy RPG with an addictive combat and progression system. Mario + Rabbids: Kingdom Battle is a gorgeous adventure and an engrossing tactical romp, offering a solid challenge and some unique combat quirks that will please tactical fans. All in all, though, Mario + Rabbids: Kingdom Battle is yet another fantastic game you should have in your library if you own a Nintendo Switch. It's clear that Ubisoft respects the sanctity of these iconic Nintendo characters, and the game certainly does them justice. Kingdom Battle might not be the most challenging tactical RPG around, but it does offer a satisfying combat flow, and provides ample opportunities for players to come up with interesting strategies and team compositions to complete a map with. Unlike some of the most recent Ubisoft games and just like Rayman, Mario + Rabbids have been made with some kind of passion that we rarely see among third party developers. when Ubisoft makes a game with passion and craze, the output is almost certainly a masterpiece. The developers at Ubisoft Milan and Paris took their time to figure what works about strategy games and elevated it to a form that can be enjoyed by many. Add to that the pure cleverness of the adventure, and what results in an absolute must play for Nintendo Switch owners. This is the best game the Rabbids have starred in and they only needed Mario to achieve it. Mario + Rabbids Kingdom Battle is an absorbing and addictive experience that combines unpredictable, tactically deep, turn-based strategy gameplay and dexterously imbues it with the humor and heart of a traditional Mario adventure. While not a traditional Mario or Rabbids game, Mario + Rabbids Kingdom Battle contains enough elements from both franchises to appeal to fans of either series. 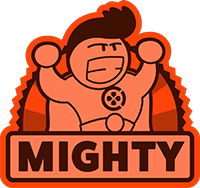 It uses humour that kids will appreciate, but parents and adult gamers will get more from. Best yet, it doesn't hold your hand, demanding a carefully-planned strategy to accomplish your goals. Mario + Rabbids Kingdom Battle is a must have for Switch-owning fans of turn-based tactical games. More importantly, such is the style and depth on offer that it's also ideal for those that haven't played much of the genre, for whom 'X-COM' sounds like a silly acronym from a war movie. It introduces the concept in the best possible way, and then utilises its own ideas for what becomes a smart and - at times - deliciously challenging experience.It's perfectly acceptable to be surprised by Mario + Rabbids Kingdom Battle, as many have been since its E3 reveal. The end result delivers on all of the potential that we could suddenly see back in June; even if you don't actually like the Rabbids, this game - and its familiar Mario cast and setting - is so good that Ubisoft's mascots are likeable. Well, almost. Mario + Rabbids could have been so much worse than this, but somehow Ubisoft's really done something special with it. And, as one of the rare cases where Nintendo has loaned its most precious property out to a third party, Ubisoft has done something that, I hope, Nintendo itself will be proud of. All in all, Mario + Rabbids Kingdom Battle is a fantastic addition to the Switch line-up, and it's also a great strategy game that brings fresh ideas to the genre. Mario + Rabbids Kingdom Battle features excellent turn-based strategy gameplay and buttery smooth combat and animations. A fluid and fun must-have for Switch owners and strategy fans alike. Who would have thought that a crossover of Mario and the Rabbids would be so damn fun to play? I thoroughly enjoyed my time venturing across the Mushroom Kingdom and taking part in tactical battles, with the accessible nature of combat proving to be entertaining even for newbies to the strategy genre. Add to the that the stunning visuals, the constant introduction of new mechanics, and the challenging yet fair difficulty curve and it’s hard not find yourself totally absorbed in Ubisoft’s bizarrely brilliant concoction. Mario + Rabbids Kingdom Battle offers a fresh and unique experience that stands out as one of the Nintendo Switch’s best titles. The love and attention to detail from the developers, Ubisoft, Ubisoft Paris and Ubisoft Milan have made me smile, giggle, laugh, and enjoy my time in a world that they have created. I am not a huge fan of turn-based games, but what Ubisoft has done here with Nintendo IP's and their brand of anarchy the Rabbids, mold really well and I want more, a lot more. A strategy based game that's challenging and well-designed enough, it might just have you shrieking "BWAAAAH!" With every successive stage the potential dangers grow, and new ones are always being added to the pile. Mario + Rabbids Kingdom Battle is one of the easiest strategy games to get into. It teaches the mechanics to the players well and encourages them to experiment with them. If you are interested in tactical games, you should definitely try it out. Especially, as the game is void of any major flaws. The whacky humour further adds to the charm of the game. A quirky crossover that seamlessly blends two universes apparently far away, a compelling strategic game that despite its simplicity has a lot of depth to it (and one that could be a perfect introduction to the genre) and above all a production that truly captures that special, peculiar Nintendo feel: well played Crying Ubisoft Man, well played. M+R Kingdom Battle is truly a gem in the crown lineup of Nintendo Switch games. It has proven its worth tenfold, and is in the rare position of having me excited for what lies ahead for it in the form of its season pass. Sometimes crossovers surprise us by bringing together in the same title two apparently disconnected licenses like these. In addition, the game allows us to see an unprecedented genre in the adventures of the italian plumber as is the turn-based strategy, and the result could not be better for this debut. Excellent Mario-Rabbids-Crossover with beautiful worlds, deep character system and strategic battles. A must-have for the Switch. Simply put: one of the best games available today on Nintendo Switch. Underneath the odd blend of Mario with the Rabbids lies a very good SRPG. Its combat mechanics are frantic, fun and complex enough to make the whole campaign a joy to play. Mario + Rabbids Kingdom Battle is a nice surprise, there is no doubt about it. Mario + Rabbids delivers a fun and refreshing take on the Mario experience that only scratches the surface of this new tactical shooter's potential. Difficulty can vary wildly and the inability to save mid-battle might frustrate some folks while also making the game a bit tough for a younger audience. Its combination of humor and solid tactical gameplay, however, makes the game exactly the kind of title that Nintendo needs from third-party developers to build up its new system's library. The best part of Mario + Rabbids: Kingdom Battle is its gameplay design. Exploring various worlds is pleasant and thanks to smart location of gold coins you can't get lost. The combat is simple but there are new mechanisms and character introduced every now and then so it doesn't become boring. My encounter with Mario and the Rabbids lasted for more than a dozen of hours and it was really fun. If you own a Nintendo Switch, you want this game, period. I didn’t know I wanted this mashup, but now that we have it, I can’t wait for the DLC, and I definitely want sequels. Mario + Rabbids Kingdom Battle may not be the deepest tactical RPG, but it delivers a solid all-around experience that takes advantage of the strengths of both Mario and the Rabbids—making for one of the most surprisingly enjoyable game experiences you're likely to have this year. Mario + Rabbids: Kingdom Battle manages to not only combine two very different franchises in what most thought to be an impossible manner; it also offers an accessible yet demanding and deep experience where no matter how difficult things may get, it remains an absolute joy to play. To Davide Soliani and Ubisoft, I offer my apologies. This is one hell of a game and I can’t wait to squeeze every treasure and perfect rating out of the game. I honestly hope that this introduces the wonderful world of turn-based tactics to more people. Ubisoft has achieved the impossible, they’ve not only given Mario his own XCOM game, they’ve created a third-party franchise that should remain a Nintendo staple in years to come. The Switch has had a great debut year, and Mario + Rabbids is another, if unexpected, excellent addition to its software library. Mario + Rabbids: Kingdom Battle proves that the combination of an eastern idea with the western one, can lead to a great result. this game has problems like the lack of online multiplayer or low variety in playable characters. but on the other hand Mario + Rabbids: Kingdom has a great campaign which can keep you entertained for a long time and make you forget the lack of online multiplayer. Mario + Rabbids: Kingdom is a great game that every Nintendo switch owner will enjoy playing it. Mario + Rabbids Kingdom Battle is another excellent addition to the Nintendo Switch's bustling first-year library of enjoyable titles. It does a great job of being accessible enough to lure strategy newcomers while also providing a good amount of challenge to vets. It comes with plenty of content to keep players going in solo and multiplayer modes, and every battle is entertaining. With a presentation that matches some of the better Super Mario titles out there, Mario + Rabbids is a perfect fit for your library. In the end, we can say that Mario+Rabbids has become one of the best adventure games of the year by utilizaing interesting and innovative ideas which are presented in the form of a strategic gameplay, an exemplary game in terms of variety with a proper approach for the design that will bring you memorable moments. The only negative factor and disappointment of the game is the lack of an online part which prevents us from enjoying the game with others, whilst the game itself demands. Overall, I must say, I was really impressed by my time with Mario + Rabbids: Kingdom Battle. It's a polished X-Com style game that removes some of the obtuse layers to ensure the early gameplay curve is accessible, uses humor very well, and kept me coming back for more. Mario + Rabbids Kingdom Battle is an idea that has paid off big time. It’s a game that a lesser company would have avoided, but both Nintendo and Ubisoft have taken a risk and I’m frankly glad they did. Mario + Rabbids defies the stigma the Rabbids bring to the table and delivers a solid tactics-based game. Mario + Rabbids: Kingdom Battle is an unexpected delight. Fans of tactical strategy games should absolutely pick this one up as soon as possible and enjoy dozens of hours of intense battles and detailed progression. Doesn't matter if you're a fan of a tactic games or a newcomer to the genre, Mario + Rabbids Kingdom Battle will please you with colorful looks, great maps design and addictive gameplay. And this adorable rabbids will definitely steal your heart. Despite owing so much to XCOM, this is a fantastically imaginative and enjoyable strategy game that's as accessible as the genre has ever been on consoles. This zany crossover from Nintendo and Ubisoft goes beyond initial expectations, setting up one of the more accessible and enjoyable turn-based strategy games in recent memory. Mario + Rabbids: Kingdom Battle is a good first step towards what will hopefully become a series for Ubisoft and Nintendo. Fans of Mario games, strategy RPGs, or even Switch games in general should grab this without hesitation. Mario + Rabbids: Kingdom Battle is a strange mix-up, with surprisingly deep mechanics and addictive gameplay. Almost like a Nintendo version of the Xcom-series. Mario + Rabbids gives you the action and strategy of XCOM in a way that does justice both to Mario and to the Rabbid's kooky style. Ubi's big E3 surprise is an unmissable Switch game. Having the Mario and Rabbids universes meet in a Tactical RPG could seem like a risky bet. But it works. Mario + Raving Rabbids Kingdom Battle is both a convincing crossover and a convincing Tactical RPG that fits perfectly on the Switch. And the local coop mode is just the icing on the cake. 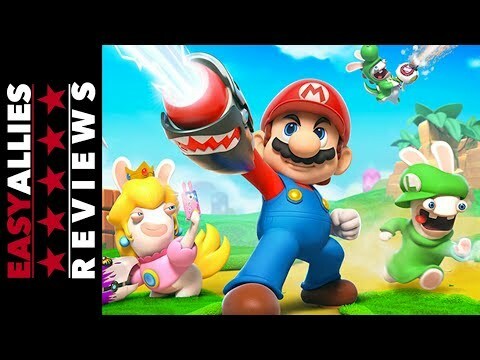 Mario + Rabbids Kingdom Battle is one of the best mash-up games in Ubisoft and Nintendo's partnership, and is a surprisingly strong strategy game to boot. As strange as Mario + Rabbids Kingdom Battle sounds on paper, there are some really good ideas in the mix. Having XCOM's battle gameplay presented in a more light lighthearted fashion and greatly enhancing character movement are both excellent touches. It's not perfect, but there's a lot to like from this unlikely combination. 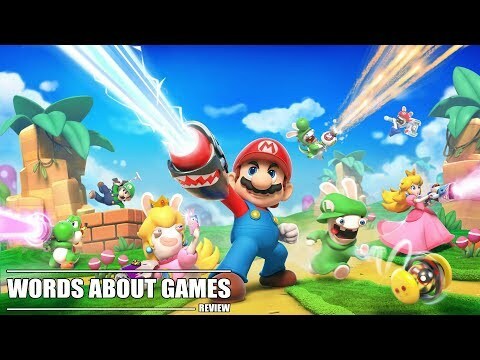 Mario + Rabbids Kingdom Battle is a hilarious, fun, and attractive looking title, despite some technical flaws here and there that are quickly overlooked due to all of its intrinsic qualities. If anything, this is perhaps the one Rabbid game that will truly push the critters into the realm of mainstream on a worldwide level, more so than they have ever been so far, simply because they are such a perfect fit with Mario in that universe, in a way that nobody would have ever expected. It's challenging, for sure, so fans of Mario who are wary of strategy games beware. If even ever so slightly interested in strategy, though, and willing to sit through it all, persevering as much as it takes to see it through to the end is a complete blast. Well worth checking out. Nothing about Mario Rabbids should work. It's enough of a shock that Ubisoft Milan managed to bring together these two worlds so well, then it successfully makes its cast the stars of a genre none of them has ever been near. Robust in how it plays and confident in its presentation, Kingdom Battle is exactly the kind of bold and fun exclusive Switch needed in its first year. Mario + Rabbids manages to walk a narrow road, offering up a legitimately challenging squad tactics experience without alienating the family friendly Mario audience. While it doesn't quite have the full layer of spit and polish of an in-house title, Ubisoft comes damn close to capturing that Nintendo magic. Hats and Mario caps off to Ubisoft: Kingdom Battle is the best Mario world so far that's not made by Nintendo and the rare kind of game where the sidekicks, the Rabbids, outshine the famous cover stars. It might be lacking in variety over time and it would have been nice to kick the plumber out of the squad for a change, but these minor flaws can't ruin the fun of an otherwise surprisingly great tactical strategy adventure. Mario + Rabbids: The Battle of the Kingdom is one of the most unexpected and beautiful games of the year, which carries with it a deep tactical gameplay with the integration of role-playing and adventure elements. If you own a Nintendo Switch, you should buy this game. There's some really fun gameplay, with great bosses. However the open world feels empty and I wish there was lots more content for returning players after a first time completion. This game, all in all, deserves to be played even if you are not much of a Strategy games fan because Ubisoft had elegantly produced a "Nintendo" title which perhaps may surpass even Nintendo themselves if they had released a Mario game in the strategy genre. Mario + Rabbids Kingdom Battle is yet another great Nintendo Switch exclusive, and one of the most original Mario titles we've seen in a long time. It may not do much outside of the core combat, but even that is enough to keep you entertained for its duration. Mario + Rabbids Kingdom Battle smoothly merged two completely different worlds into a quirky, comical story with addictive gameplay. At the same time it managed to mold its own identity on a system that needs this kind of game. Mario and Rabidds come together in a videogame with high doses of humor, entertainment and style. Ubisfot and Nintendo join forces to create a great exclusive for Nintendo Switch. Mario + Rabbids: Kingdom Battle combines one of the most beloved names in video games with a horde of manic, cartoon rabbits for a surprisingly satisfying turn-based strategy experience. Mario + Rabbids Kingdom Battle has a special charm to it, which is something I didn't expect to say when first hearing about the project. While the allure of these two franchises coming together may be the draw for many, the surprising depth to its combat and the replayability that it offers are the real highlights. The fact that Mario + Rabbids Kingdom Battle turned out as well as it did makes me hope to see Nintendo work with other developers again in the future to utilize their beloved characters in new, unique ways just like this. Easily the best game the Rabbids have ever been in and quite possibly Mario's best non-Nintendo spin-off. Mario + Rabbids is a nice mix of puzzles and turn-based tactical fights for younger audiences. It’s off to a slow start and gets better over time, containing a fair amount of content, collectibles and bonus challenges. It may not have the most elaborate combat system of all time but definitely brings unique ideas and concepts to the table. 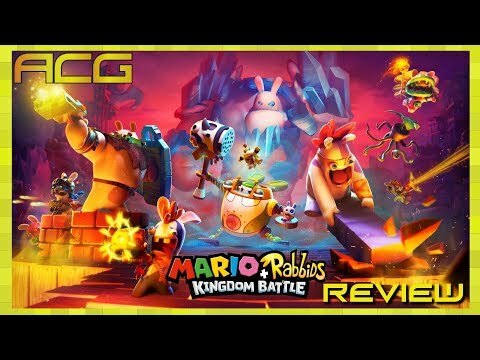 Mario + Rabbids: Kingdom Battle looks, plays and sounds better than you would've ever expected from such a confusing crossover - an interesting take on the X-COM formula that can start to feel tedious, but starts amazingly and will keep many players stuck into the turn-based strategy shooter. Mario + Rabbids Kingdom Battle's guts are impressive, but its main event feels like a [good] expansion for a fleshed-out strategy RPG that has more to offer than a great combat system. By the time it opens up halfway in and you really start to delve into the skill tree, it begs to be played. But until then both exploration and some battles feel like going through the motions in a "kinda sorta" tutorial way. Mario + Rabbids Kingdom Battle gets more right than wrong in creating a casual and fun tactics experience, but tedious puzzle sections and a shotgun approach to Mario references holds it back from greatness. Mario + Rabbids Kingdom Battle is very charming and the whole aesthetic is a labor of love. However, pesky gameplay shortcomings and a nasty difficulty spike halfway through hamper this Nintendo love-letter. Mario + Rabbids: Kingdom Battle is a joy to play and is one of the most charming releases of the year. This rollercoaster ride of a turn-based strategy game starts out almost impossibly strong, but by the end I mostly wished it'd been over three hours earlier.